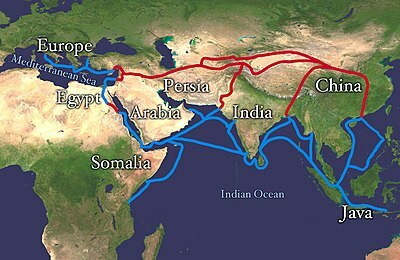 Silk Road extending from Europe through Egypt, Somalia, the Arabian Peninsula, Iran, Central Asia, India/Pakistan, Java-Indonésia, and Vietnam until it reaches China. The land routes are red, and the water routes are blue. Jalur Sutra (Hanzi tradhisional: 絲綢之路; Hanzi sing Diprasajakaké: 丝绸之路; pinyin: sī chóu zhī lù, basa Pèrsi راه ابریشم Râh-e Abrisham) iku jalur urutan liwat Asia Kidul sing diliwati déning karavan lan kapal laut, lan nggandhèngaké Chang'an, Tiongkok, karo Antiokia, Suriah, lan uga papan liyané. Pangaruhé kagawa tekan Koréa lan Jepang. Silih genti iki wigati banget ora mung kanggo pangembangan kabudayan Tiongkok, India lan Roma nanging uga wujud dhasar saka donya modhèren. Istilah 'jalur sutra' sepisanan dipigunaaké déning géografer Jerman Ferdinand von Richthofen ing abad kaping 19. Jalur Sutra bawana mérang dadi jalur lor lan kidul mangkono jalur mau mawiyar saka pusat perdagangan Tiongkok Lor lan Tiongkok Kidul, rute lor ngliwati Bulgar-Kypchak nuju Éropah Wétan lan Ujung Crimea, lan saka kana nuju Laut Ireng, Laut Marmara, lan Balkan nuju Venezia; rute kidul ngliwati Turkestan-Khorasan nuju Mesopotamia lan Anatolia, lan banjur nuju Antiokia ing Kidul Anatolia nuju Laut Tengah utawa liwat Levant nuju Mesir lan Afrika Lor. Hubungan dalan ril sing ilang ing Jalur Sutra dirampungaké taun 1992, nalika dalan ril internasional Almaty - Urumqi dibukak. Pameran British Library Silk Road, dengan versi digital The Diamond Sutra, buku tercetak tertua di donya. Boulnois, Luce. 2004. Silk Road: Monks, Warriers & Merchants on the Silk Road. Terj. olèh Helen Loveday dengan bahan tambahan olèh Bradley Mayhew dan Angela Sheng. Airphoto International. ISBN 962-217-720-4 (Hardback); ISBN 962-217-721-2 (Softback). Bulliet, Richard W. 1975. The Camel and the Wheel. Harvard University Press. ISBN 0-674-09130-2. Casson, Lionel. 1989. The Periplus Maris Erythraei. Text with Introduction, Translation, and Commentary. Princeton University Press. ISBN 0-691-04060-5. Elisseeff, Vadime. Editor. 1998. The Silk Roads: Highways of Culture and Commerce. UNESCO Publishing. Paris. Reprint: 2000. ISBN 92-3-103652-1 (pbk); ISBN 1-57181-221-0; ISBN 1-57181-222-9 (pbk). Foltz, Richard C. 1999. Religions of the Silk Road: Overland Trade and Cultural Exchange from Antiquity to the Fifteenth Century. New York: St. Martin's Griffin. ISBN 0-312-21408-1. Harmatta, János, ed., 1994. History of civilizations of Central Asia, Volume II. The development of sedentary and nomadic civilizations: 700 B.C. to A.D. 250. Paris, UNESCO Publishing. Hopkirk, Peter: The Great Game: the Struggle for Empire in Central Asia; Kodansha International, New York, 1990, 1992. Hulsewé, A. F. P. and Loewe, M. A. N. 1979. China in Central Asia: The Early Stage 125 BC – AD 23: an annotated translation of chapters 61 and 96 of the History of the Former Han Dynasty. E. J. Brill, Leiden. Juliano, Annettte, L. and Lerner, Judith A., et al. 2002. Monks and Merchants: Silk Road Treasures from Northwest China: Gansu and Ningxia, 4th-7th Century. Harry N. Abrams Inc., with The Asia Society. ISBN 0-8109-3478-7 ; ISBN 0-87848-089-7 (pbk). Klimkeit, Hans-Joach, im. 1988. Die Seidenstrasse: Handelsweg and Kulturbruecke zwischen Morgen- and Abendland. Koeln: DuMont Buchverlag. Klimkeit, Hans-Joachim. 1993. Gnosis on the Silk Road: Gnostic Texts from Central Asia. Trans. & presented by Hans-Joachim Klimkeit. HarperSanFrancisco. ISBN 0-06-064586-5. Knight, E. F. 1893. Where Three Empires Meet: A Narrative of Recent Travel in: Kashmir, Western Tibet, Gilgit, and the adjoining countries. Longmans, Green, and Co., London. Reprint: Ch'eng Wen Publishing Company, Taipei. 1971. Litvinsky, B. A., ed., 1996. History of civilizations of Central Asia, Volume III. The crossroads of civilizations: A.D. 250 to 750. Paris, UNESCO Publishing. Liu, Xinru 2001 “Migration and Settlement of the Yuezhi-Kushan: Interaction and Interdependence of Nomadic and Sedentary Societies.” Journal of World History, Volume 12, No. 2, Fall 2001. University of Hawaii Press, pp. 261–292. .
McDonald, Angus. 1995. The Five Foot Road: In Search of a Vanished China. HarperCollinsWest, San Francisco. Mallory, J. P. and Mair, Victor H. 2000. The Tarim Mummies: Ancient China and the Mystery of the Earliest Peoples from the West. Thames & Hudson, London. Osborne, Milton. 1975. River Road to China: The Mekong River Expedition, 1866-73. George Allen & Unwin Lt.
Puri, B. N. Buddhism in Central Asia, Motilal Banarsidass Publishers Private Limited, Delhi, 1987. (2000 reprint). Ray, Himanshu Prabha. 2003. The Archaeology of Seafaring in Ancient South Asia. Cambridge University Press. ISBN 0-521-80455-8 (hardback); ISBN 0-521-01109-4 (paperback). Sarianidi, Victor. 1985. The Golden Hoard of Bactria: From the Tillya-tepe Excavations in Northern Afghanistan. Harry N. Abrams, New York. Stein, Aurel M. 1912. Ruins of Desert Cathay: Personal narrative of explorations in Central Asia and westernmost China, 2 vols. Reprint: Delhi. Low Price Publications. 1990. Stein, Aurel M. 1921. Serindia: Detailed report of explorations in Central Asia and westernmost China, 5 vols. London & Oxford. Clarendon Press. Reprint: Delhi. Motilal Banarsidass. 1980. Stein Aurel M. 1928. Innermost Asia: Detailed report of explorations in Central Asia, Kan-su and Eastern Iran, 5 vols. Clarendon Press. Reprint: New Delhi. Cosmo Publications. 1981. Stein Aurel M. 1932 On Ancient Central Asian Tracks: Brief Narrative of Three Expeditions in Innermost Asia and Northwestern China. Reprinted with Introduction by Jeannette Mirsky. Book Faith India, Delhi. 1999.
von Le Coq, Albert. 1928. Buried Treasures of Turkestan. Reprint with Introduction by Peter Hopkirk, Oxford University Press. 1985. Whitfield, Susan. 1999. Life Along the Silk Road. London: John Murray. Yan, Chen. 1986. “EARLIEST SILK ROUTE: The Southwest Route.” Chen Yan. China Reconstructs, Vol. XXXV, No. 10. Oct. 1986, pp. 59–62. Kaca iki pungkasan diowah nalika 04.05, 17 Oktober 2018.